You. Me. Ride This Crazy Train - Adventures and Observations on The GO: I has a Sheldon Cooper? This site is read by folks who know me personally but are far away and not on Facebook, so it can be a conduit sometimes to share aspects about my personal life all in one shot. The diagnosis is in. My daughter, 8, has an Autism Spectrum Disorder (ASD). Now we know why it's all dinosaur all the time! This is a group of developmental disabilities that can cause significant social, communication and behavioral challenges. This doesn't change our family nor will it define who she is, but what this diagnosis does is merely provide answers for all the quirky things she does. Next steps is empowering her to understand her disability and how to live with it, how to advocate for herself and enroll her in programs to help her with these challenges. My saving grace is I grew up immersed in this world because of my sister who is severely intellectually disabled. This gives me valuable insight. I'm blessed that I have family and lifelong friends who will understand. Although my daughter and sister are very different, the challenges my daughter will face are similar in that she will require patience and guidance in excess of what a non-autistic child demands, especially among her peers and in school. Although we live in Durham Region, my daughter attends a school in the Kawartha Pine Ridge District School Board where several teachers have taken courses on how to offer front-line autism support to students. Her school also offers resources such as sensory safety rooms and music programs designed to help autistic children. These are all good things, plus there are camps and workshops my husband and I can send her to. 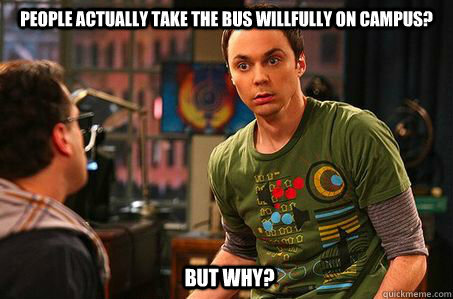 In a nutshell, for those who watch Big Bang Theory: we has a Sheldon. I just need to buy her bus pants. I am also open to hearing from other parents who are on this same journey. You can email me at my non-crazy train account: csmith8965@rogers.com. My daughter does not have autism, but she has a learning disability and some social disorders. As a parent who has been through the school system with a child with special needs, I am going to advise you to get your fight ready. The school boards get extra funding for children who are diagnosed with disabilities. Because schools are so desperate for funding, that extra funding is not always used as it is supposed to be used. I strongly recommend that if you can afford it or find it offered to you at no cost, you have all recommendations made by someone OUTSIDE the school system. Then, you must pay very close attention to is recommended and what the school provides and what the difference is. Be prepared to fight the school every step of the way. I pray you don't have to, but it is better to be prepared than disappointed. If you want more information on the hell I had to go through with the school board, you can text message me. Think dental floss and you will know where to find me. I knew that which is why I refused to allow the resource teacher there to take the lead on anything to do with my daughter but at the same time, I've seen the school put many programs in place to help their autistic students. I saw my mom fight all the time. Fight for more time. Fight for more guidance. Fight for more assistance. Fight for supervision. Always fighting. It's my understanding the Kawartha Pine Ridge District School Board is fantastic with how they spend the money but my concern is the one teacher who won't understand and fighting with him or her. Good luck, CJ. Sounds like you're getting prepared to deal with this as things come along. Hi CJ, I also have a daughter (who is now 13 years old) who was diagnosed with Autism at around age 6. I'm also in the Durham area. It has been challenging and frustrating and like you I am working on empowering her on understanding and living with her disability. I'm happy to hear that you have the support from family and friends, it makes a huge difference. I am still working on that, I've found that Autism has so many different aspects that it can be hard for people to understand. My daughter is about to enter highschool, and I am already feeling the anxiety. Thanks for sharing your story, it has given me something to think about. No advise to share, but as you say, this does not define who she is, it just another piece of what makes her "her". Being a Sheldon is certainly not all bad - after all, he amkes more money than he needs doing a job he loves, has friends who sahre his interests an active social life. Sure, he drives people crazy at times, but who does't? I have always applauded your courage for standing up for what you believe in, sometimes it's a little on the heavy side, - [which, considering my own ASD (in the process of being officially diagnosed as Asperger's) and at almost 42, just having my autism medications increased yesterday, for the third time over the past two years - just a fabulous drug by the way!!! ), ultimately caused me to loose my cool with you after one of our conversations] - so that being said, your personality type will be a godsend in making you a fabulous advocate for your girly girl! I pitty the fool who steps in your way! We spend $90 an hour for ABA care that is super hard to come by... a complete necessity and just totally time consuming. Not only will "J" be on a million wait lists, you will have many people tell you there is nothing wrong with her - from teachers to doctors, you will have to fight for your right with even the Government for credits that are completely deserving. Then... people will say "Oh.. but you receive funding in your taxes for your child"... trust me... it hardly covers the dang gas and time I have to take off work to take part in said therapy or even teach them things myself because the school system isn't prepared for such an influx of children with these type of problems. My son, who can't put together a sentence received an inflated B+ in oral communication so the board wouldn't have to provide extra assistance. They just don't have the means (or the care in my opinion). Cindy my dear... I cannot explain to you how awesome it is that she has been diagnosed - it's a relief as much as a curse, as I'm sure you are feeling, but it helps... only just a bit - Your battles have just begun!! What I learned (1) Make Resources for Exceptional Children your BEST FRIEND. They pull so much information, funding and support out of their butts it's completely mind blowing. I wouldn't have made it if it wasn't for them. YOU WILL have a giant wait list for this! (2) Kerry's Place and Kinark. WOW... Love them.... They are brilliant. again.... WAIT LIST! (3) Take Resources For Exceptional Children to EVERY School meeting. You may have a great school, teacher, principal now... the school system may seem on your side now... but trust me.. pleaaaassse don't be like me..... They WILL become your worst enemy. If we didn't have RFEC take minutes and be our witness to the crap that went down last year, we would have been up shits creek. Those are my super long words... I honestly could type for hours.... but these are the tid bits you really need to know!!!! ^ You don't know how much I've missed you.